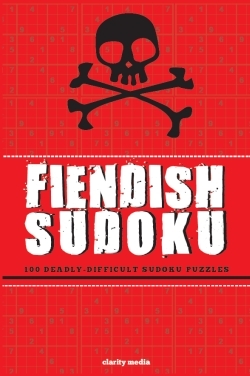 Welcome to this fabulous collection of 100 fiendish sudoku! 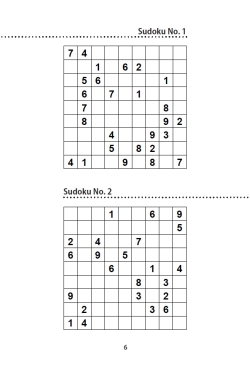 Gathered inside this book are some of the most testing and tricky sudoku puzzles you will find. Ready for a challenge? Put your puzzle solving skills to the test and see if you can crack them all. You don't need any advanced mathmatical skills to complete these puzzles, they can all be solved using logic alone. Puzzles will of course require all the usual solving rules from standard easy and medium to solve, but that won't be enough with these fiendish puzzles: they also require harder rules. You'll need to look at sets of numbers (for instance if exactly two squares in a row can contain the values of 2 and 5 then, no matter how many other candidates in those squares, you know they can be eliminated as these two squares must contain 2 and 5 in that row). And for many of the puzzles you'll also need X-Wings: if you don't know what that solving rule is then you can have fun working it out, or just read inside the book! We have included some great solving tips and full solutions to help you along the way. Beware- Once you start, you won't be able to stop!